Thomas Rowson talks about the causes for The 50 Hour Rebellion. The charity sector has come in for a lot of criticism of late. The scandals that have been in the news have been shocking, and the condemnation of the charities involved in such acts has been total. Thousands phoned to cancel their regular donations to Oxfam, with others like the Red Cross and ONE being reported in further scandals as the sector takes hit after hit. The shameful scenes of The Presidents Club, an annual fundraising event dogged by accusations of sexual harassment, only caused more damage. 2018 will be a watershed in the history of charity. New legislation and systems will come into place to make sure that these shameful actions cannot be repeated. Those responsible for such atrocities should face the fullest penalty possible, as should anyone who involved in covering up the despicable deeds. It has broken the public’s trust, and threatens to undermine the great work these organisations do. It must not be forgotten that the people behind the negative headlines are a very small minority. Most in the charity sector are good, honest people, genuinely working hard to make a difference. These few have tarnished the image of all charities, not just the ones caught in the middle. And yet every day, people across the world donate to NGOs, or sit in baths of baked beans, or run marathons dressed as Stormtroopers. They do this because they know what it means, and to help make this world a better place. Here at Rebel, we’re exactly the same. I’ve seen the great work that charities do. For the past four years, I’ve been involved with Bloodwise, the UK’s blood cancer charity, and I could fill every page of the upcoming third issue of Rebel magazine with the amazing stuff they do. No pictures. Size six font. Single spaced. I love this organisation. I’ve been on one of their committees for years and I’ve done many fundraising events for them, from triathlons to walking over 100km of the Sahara desert. These are brilliant people, really making a difference. 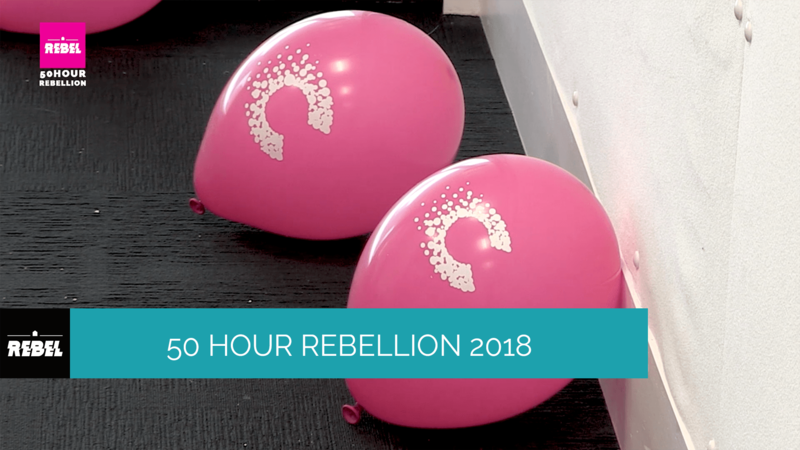 It’s why I was so pleased that, in 2017, the inaugural The 50 Hour Rebellion was held for their benefit. The idea was deceptively simple: 50 hours of non-stop radio. The genesis of the event was two-fold. A lifetime ago, I did my undergrad degree in Hull and was part of that student station, JamRadio. We could only broadcast when the union was open, which meant that, just after 10pm, the station was automated until the morning. One night a year, the building was open all night, as people queued for tickets to the End of Year Ball. This was our opportunity – and so we broadcast all night too. It was the best night of the year, every year, and really brought the station together. At Rebel, we can broadcast 24/7 any night of the year, but I wanted to revive that spirit we used to have for that oh-so-special broadcast. This seemed like a pretty good way to do it. The other spark of inspiration was one of my brothers, Edward, who is an award-winning radio presenter in his own right at the University of Leicester’s Galaxy Radio. He’s also about 5 inches taller than me, making me look short at just over 6’4”, despite being too tall to go on the Space Shuttle (the only reason I haven’t been into space). Each year, they hold their own marathon broadcast, having a lot of fun in doing so, and encourage other stations to do the same. It was an invitation we could not refuse. And so, on May 11 2017, we started a radio broadcast at 9am that didn’t finish until 11am on the 13th. We had such a range of fantastic shows throughout, with members old and new coming together to present special editions of regular shows, one-offs, play football with live commentary, and do the Macarena in Square 3 in an inflatable dinosaur costume. It was incredible, and we raised over £185 for Bloodwise. We also had an immense amount of fun in the process. In fact, we had so much fun, that we decided to do it again in 2018, albeit this time in March. It was the perfect time to do it, but the weather had other ideas. Sadly, the snow meant having to cancel our broadcasts from Square 3 and our football match, which was a great shame. The members rallied round, however, and we had hour after hour of fantastic content from the studios. One of the highlights was our original play, The Murder and The Mystery: Colchester Drift, which I thoroughly enjoyed writing and was longer than my undergrad dissertation! This year, we turned Rebel pink as we were fundraising for Cancer Research UK and the fight against breast cancer, with over 300 women diagnosed with breast cancer in the UK during the course of our broadcast. We set ourselves the ambitious target of raising £250 – as this went online, we had unbelievably passed the £620 mark. Over the 100 hours of the two events, I had less than 7 hours sleep in total, but when looked at in context of what we achieved, it was absolutely worth every difficult hour of keeping my eyes open. The biggest thing for me was how Rebel came together as a community to create these epic broadcasts and raise money for such important causes. There were so many members who got involved; all of them were absolute stars and we wouldn’t have been able to do this event without each and every single one of them, legends all. The bonhomie and spirit flowed throughout, encouraging everyone when eyes were bleary and the campus deserted. This was best summed up by one of the many stars of the event, Hélène Deuxtrois, who said that ‘It’s amazing to be able to help so many people whilst having so much fun.’ I don’t think I could have put it better myself. I am so incredibly proud of the effort and determination that everyone put in, and so pleased that The 50 Hour Rebellion will be back at 9am on the first Thursday of March in 2019. However, I’m also devastated that I won’t be here to be part of it, my time with Rebel coming to an end this July, but I cannot wait to see what the team does with it next year. I know that whatever they do will be amazing. The charity sector has had a wake-up call this year, but we have shown that we the public are still willing to support the great work they do, provided they can prove themselves to be responsible with our trust. If you wanted to donate to The 50 Hour Rebellion and the fight against breast cancer, you can do so HERE.